The Greeks knew how to inscribe in a circle, using only a straightedge and compass, an equilateral triangle (3-gon), a square (4-gon), a regular pentagon (5-gon), a regular pentadecagon (15-gon), and any -gon, -gon, -gon, and -gon. That’s it. Then, 2000 years later, the 18 year old Gauss showed that it was possible to do the same with a 17-gon (and later certain other regular polygons). He was so proud of this discovery that he decided to pursue a career in mathematics. He also asked that a 17-gon be inscribed on his tombstone. His wish was not honored, but it was later inscribed on a memorial in his honor in his home town of Brunswick. (If anyone knows where I can find a photo of it, please link to it in the comments.) [Update:] a 17-pointed star was inscribed on a memorial erected in his honor in his home town of Brunswick. In the photo below you can (barely) see the star under Gauss’s right foot. Here is a closeup. Ludolph Van Ceulen spent most of his life computing the first 35 digits of pi. 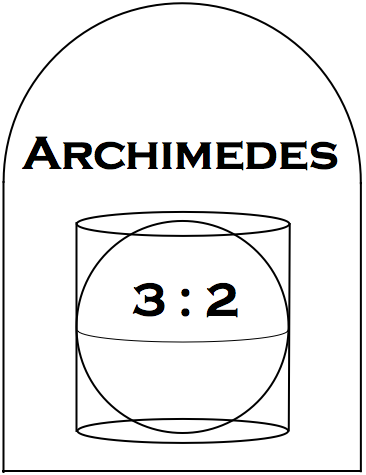 He used Archimedes’ technique and polygons of sides! His tombstone contained his upper and lower bounds for pi. The original tombstone disappeared some time around 1800; a replica is shown below. 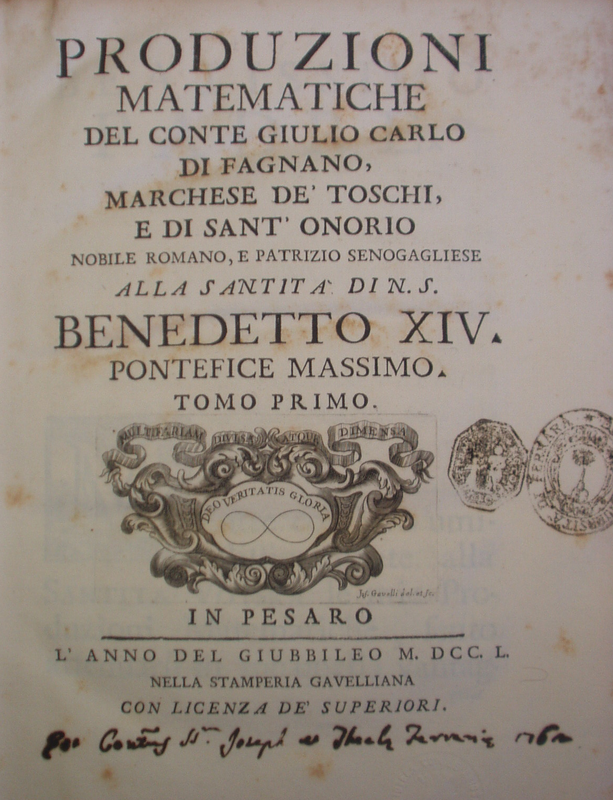 Bernoulli was so enamored with the logarithmic spiral that he wanted it engraved on his headstone. However, the engraver accidentally carved an Archimedean spiral. The tombstone of physicist Ludwig Boltzmann contains his entropy formula . 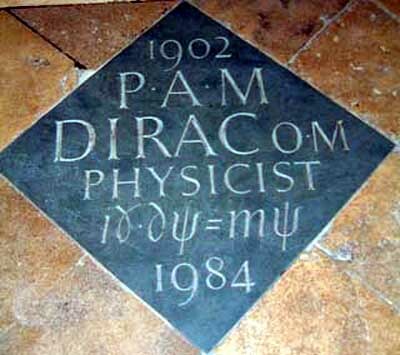 This burial plaque can be found in Westminster Abbey, not far from Isaac Newton’s resting place. It contains Dirac’s relativistic electron equation, . 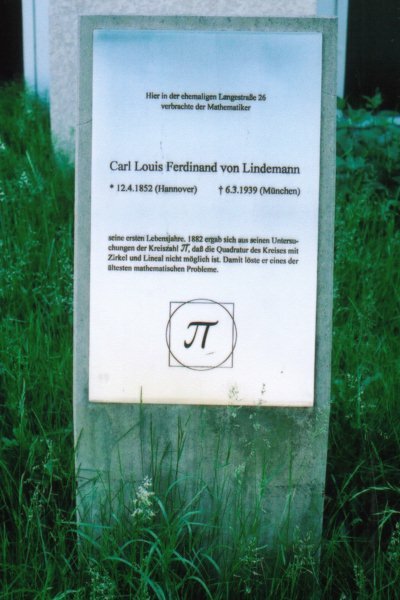 In 1882 Lindemann proved that pi is a transcendental number. This put to rest the 2000+ year old question of whether it is possible to “square the circle“—i.e., construct, using only a compass and straightedge, a square having the same area as a given circle. (He proved that it was impossible.) 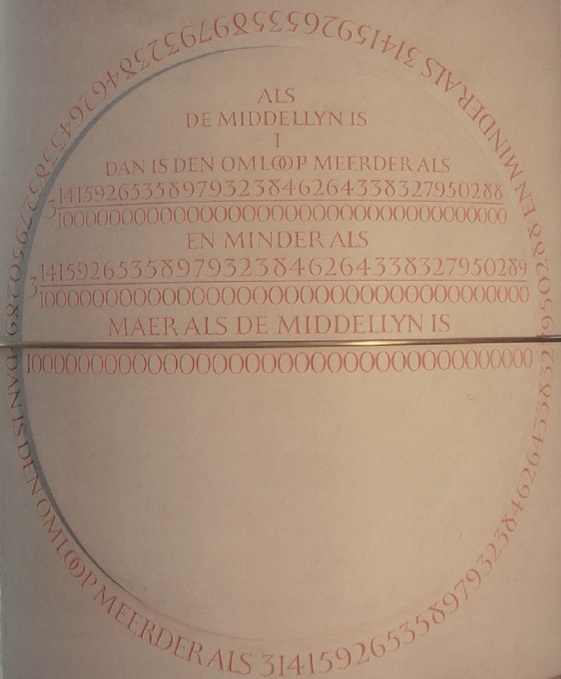 His grave has a circle superimposed on a square, surrounding the symbol pi. Henry Perigal was an amateur mathematician who discovered the “dissection proof” of the Pythagorean theorem. The proof can now by found carved into his headstone. The words in the mis- spiral at the bottom, “Eadem mutata resurgo”, translate to “Though changed I shall arise the same” so I am told… it refers to that quality of the spiral to remain the same under transformation. Thanks, Pat. And thanks for the heads-up about Lindemann and Perigal. Albert Einstein never had a tombstone (he was cremated, sans brain, and his remains were poured into the Delaware River near Trenton), but if he had, which of his two best known equations would have been written thereon? That’s the clearest image of the memorial I’ve seen… but I don’t see the 17-gon (do you?). It would be nice to see a close-up. Dave, it is the base of the pedastal that is supposed to be a heptadecagon. Do you have a source for that, Pat? The more I look into this the less certain I am of anything. Most sources say that the 17-gon is inscribed in the memorial. This source says that the memorial doesn’t have a 17-gon, but a 17-pointed star. I did, eventually, find your solution, that the pedestal is in the shape of a 17-gon. What’s the truth? Have you been there to look at it? An eyewitness source would be excellent. Dave, I haven’t been there (got at close as Weisbaden but couldn’t get up even to Gottingen).. I don’t know the russian? author, but Jeremy Gray is usually a first rate historian. I think he is still at Open University. will try to contact. Pat, I found a picture of the Gauss monument and updated the post. See above! This is very interesting! Thanks for compiling it. might even turn a profit. 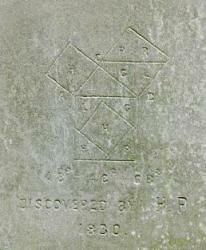 Calvin Smith posted a photo of a tombstone with a mysterious equation on Google+: https://plus.google.com/+CalvinSmith79/posts/gN2fdCjd5jE. It looks like it belongs to the actuary Albert Quiquet.